I have recently had some time off and read a number of interesting books. This one I borrowed from the library. I have previously read Kate Atkinson's Jackson Brodie novels and short story collections. 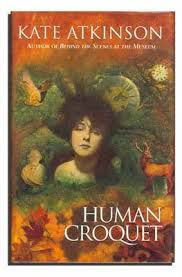 Here is my take on her second novel Human Croquet published in 1997. I mostly really enjoyed it. By the end, the story had completely spooled out of control, stretching believability, but by then I was so caught up I didn't mind. I read this novel in a single sitting (it was that sort of day). The story is an intergenerational time-slip family saga with an English village setting with mythical medieval history and encroaching forest. I think much of the joy of this sort of story comes from the unexpected deviations and plot turns so I won't go into the story except to say it focuses on a girl, Isobel on the eve of her sixteenth birthday as she reflects on the impact on her young life of her mother disappearing from the family when she was a toddler. The overall tone of the novel is surreal and magical, like some of Isabel Allende's novels. It also reminded me of an Iris Murdoch novel, The Philospher's Pupil, I read a few months ago. Like Murdoch, Atkinson is incredibly smart with her characterisations: their interactions, motives, insecurities and anxieties. Like Murdoch too, the male characters in Human Croquet are overloaded with human frailty and behave pretty badly. I do find with the Kate Atkinson novels (including the Jackson Brodie series) that they are very intense, with the plot often circling back in on itself, and I don't remember all of the detail once I have finished. But I think that is okay when the novel is so engaging and I don't mind being challenged by her. I look forward to reading her latest, Life After Life, soon.